Getting along with others means many things. It means listening and being heard. It means sharing and taking turns. It means being able to negotiate and work things out. It means being curious about difference and open to knowing more. Getting along means feeling valued and making the others you’re with feel valued too. Getting along with others is about give and take. It’s about trusting others and enabling them to place their trust in you too. Most of all, it’s about that feeling of being connected with others and the deep satisfaction that connection, or feeling of belonging, brings. 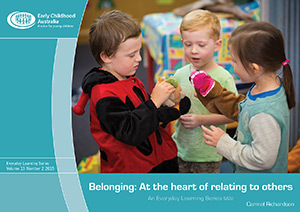 This book is designed to help parents, families and early childhood educators who work with children from birth to age five understand how important their role is in supporting children to get along with others. Getting along with others is based on secure attachments and sensitive, responsive relationships with reliable, nurturing adults who use everyday experiences to model thoughtful interactions. The book will draw on some real examples to demonstrate how families and educators can support young children to learn, in everyday ways, how to get along with others. To buy a subscription to the series online, please click here.